I first knew Jim Toenjes as an archaeologist who works closely with the eminent Cahuilla scholar Lowell Bean. One day I happened to glance in Jim’s car trunk and realized with a start he is an archaeologist who also has a trunk full of paintings. It took even longer before I understood the extent of it: This archaeologist is in fact one of the great unrecognized landscape painters of the Coachella Valley. My slow dawning is typical for those who meet Jim. Born in Nebraska in 1951, he’s a red-haired, loose-limbed modest soul–the kind of fellow who makes gingerbread when you visit. He keeps his treasures well hidden behind his courtly manner. Once I knew Jim was a painter I invited myself along on a paint-out. I met him in a vacant lot at Tachevah and Cerritos near his Palm Springs home. 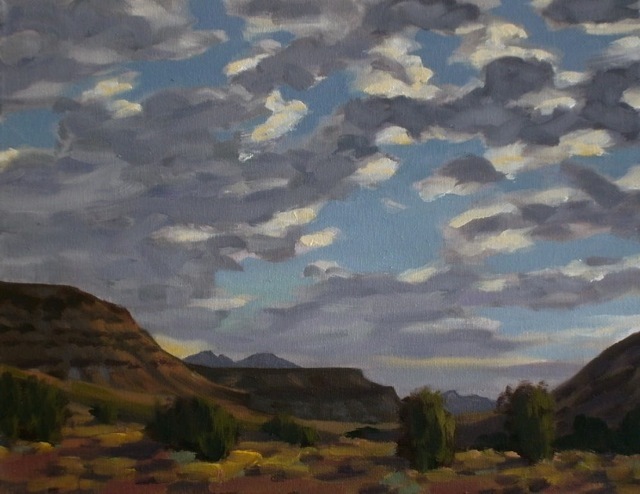 Given the McDonalds wrappers blowing around our feet, it didn’t seem a promising location–until Jim pointed out the afternoon light on the distant hills near Araby. Under his concentrated gaze, the dirt patch became the vast open desert of an earlier era. I took away a mental image: Jim standing at his easel in his old hat, pipe jammed in his shirt pocket, in the timeless stance of a Lockwood de Forest or Alson Clark. Jim has lived in Palm Springs for 40 years, and tends not to focus on monoliths or famous vistas. 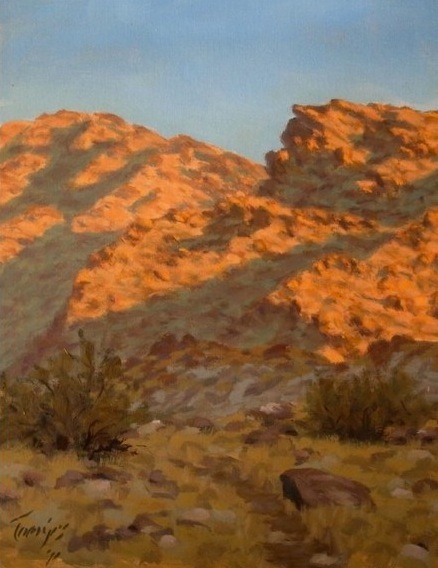 Instead he finds small, unspectacular corners of the desert that he paints again and again. His archaeology naturally informs his art. Jim learned to scan the dunes looking for ancient potsherds and burnt clay long before he tried to paint dunes. In fact it was on an archaeological survey near Angels Camp in 1978, that he started painting seriously. He’d been around art all his life. Jim’s mother, Carolyn, did woodcuts, sculpture and paintings. His sister Juli, also an archaeologist, works in landscape and portraiture. Jim also fooled around with charcoal and oils, but as a teenager, golf held his attention more than painting. He was on the Palm Springs High School golf team, and had a summer job scrubbing golf carts with another famous local painter and golfer, Terry Masters. He later studied archaeology at the University of California, Santa Cruz. But then, at Angels Camp, staying in an old gold rush hotel, he had his weekends off and soon tired of playing cribbage with the older guys. He began thinking about an abandoned stage stop he saw everyday while driving to the job site. He went to a crafts store and bought pastels and posterboard. The resulting painting of the stage stop became the first real expression of his art career. 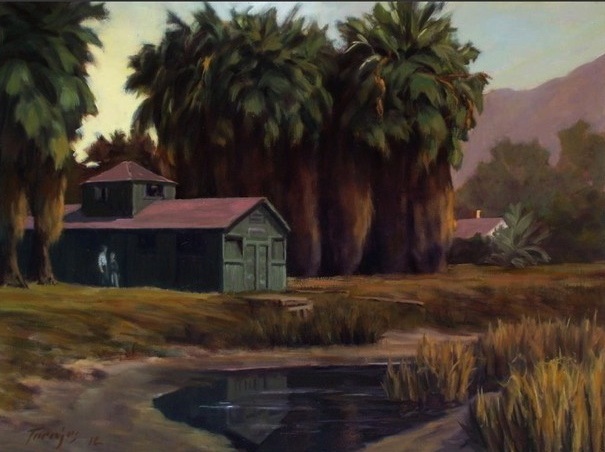 A few years later he phoned a Palm Desert artist he knew, Jack Rowe, and asked for lessons. Jim began making trips to Rowe’s dome house up on Highway 74 in the Cahuilla Hills. The collaboration turned into one of those rare teacher-student relationships. Though Rowe has left the Valley, Jim continues to pass on Rowe’s ideas–learned at the Art Institute of Chicago–to his own students. In recent years, Jim’s worlds of archaeology and art have merged in his Cahuilla paintings. He painted a portrait of the all-female tribal council of 1953, the old bathhouse (where the Spa Hotel is today), Chief Francisco Patencio (tribal leader in the 1930s and 40s) and the late tribal leader Richard Milanovich. Jim also paints places resounding with Cahuilla lore. 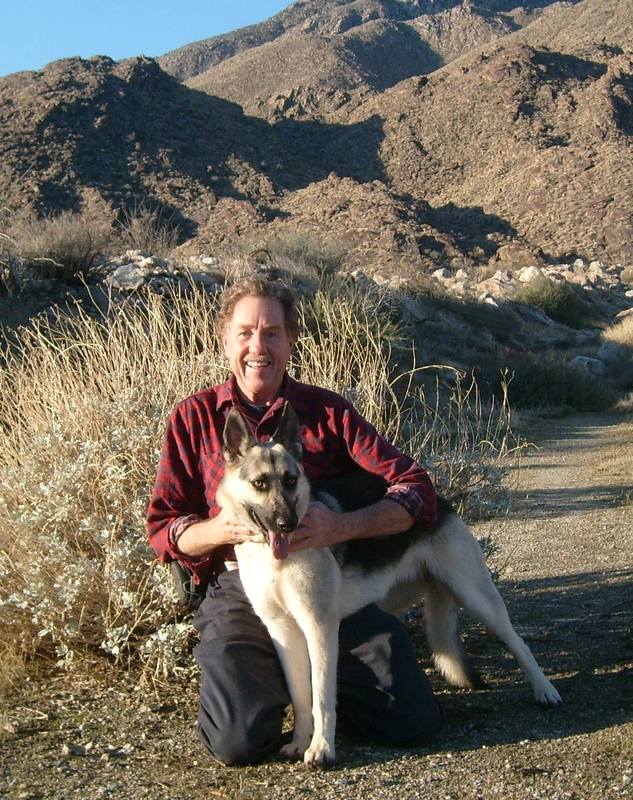 His favorite early morning haunt—with his German shepherd, Greta—is Eagle Canyon, or Oswit, in Palm Springs where Indians used to pluck eagles from the white cliffs. “I like the light up there in the morning because the colors are so much like those in Maxfield Parrish’s paintings,” he says. 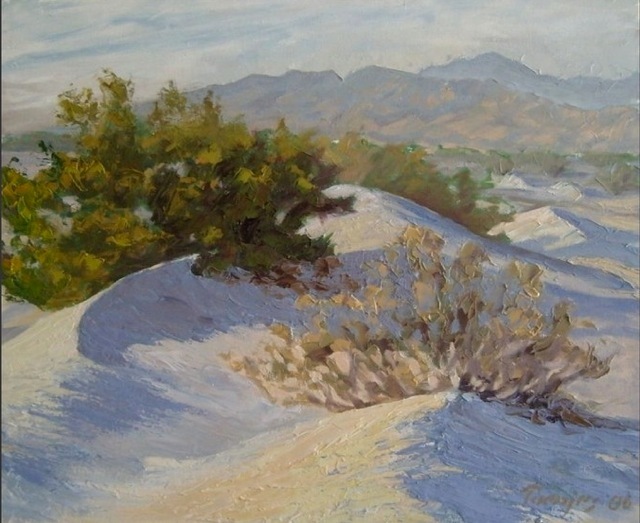 With his Cahuilla paintings, Jim joins a small, exclusive club which includes Paul Grimm. Historically, few artists painted the Cahuilla Indians. Western artists tended to focus on the Plains and Pueblo Indians–considered to be more colorful. Michael Seery, owner of Dandt’s Custom Framing in Cathedral City, got to know Jim’s work when he framed the artist’s painting of the tribal council. 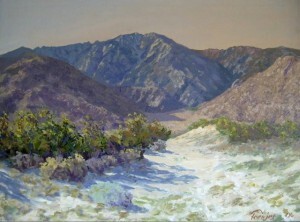 A fan of California Impressionism, Seery had been looking for years for a classic desert painter to feature in his shop. Great to read more about Jim. I met him on my last painting trip to Palm Springs and really enjoy his work. He knows the desert.